This post is about the best tips we could find on conducting effective meetings. 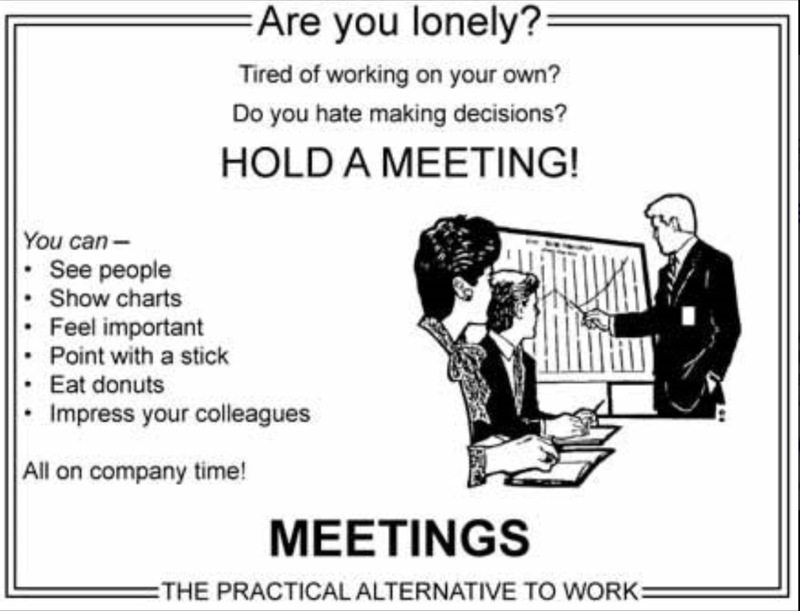 Meetings remain one of the biggest time-wasters in companies today, compounding to huge annual losses of productivity year after year. Give time back to the team to get things done by implementing these tips. 1. The meeting is defined – scrum? Sales? Weekly catch-up? What is the point of the meeting? What is the style? What am I expected to bring to the table (literally and figuratively)? How relevant is the meeting to me? After-works drinks and a sprint-planning meeting are two very different kinds of meetings. In advance, each person needs to know what is going on format-wise for most productivity to occur. Preventing the meeting from going off topic is critical. It is all too easy for the point of the meeting to be lost, and for discussions or arguments to carry over onto unrelated issues. The designated person for organizing the meeting should appoint a time up to when new ideas should be submitted, and then distribute the agenda in good time for everyone to come prepared. This is the agenda that should be followed without exception. Unless specified, a brainstorming session is not a productive use of a meeting. It is a vague activity that requires flexible amounts of time to get acceptable results. If something needs to be brainstormed, a brainstorming session can be set up afterwards with the right people. If you have a lively team or group in a meeting, it can sometimes be more efficient to use a loud buzzer to warn people that they are going off topic rather than try to talk them down. The sounding of the buzzer signals that the person must stop talking immediately. This is not for every style of company, but for a passionate team it may be the faster way of reminding people that they are off-topic without having to waste time getting back to the original question at hand. Something like the 2-min GTD rule of replying to an email, not every decision needs to be made in a meeting. The expertise of your staff is not increased by only allowing them to make decisions under supervision. Allow them to make decisions with the understanding that they are responsible for the outcome. If they are unwilling to go this path, then figure out why. Is the company culture too condemning of mistakes? Is it difficult to prove accountability? Do the staff not want the responsibility for some other reason? In any case, find ways to have quick decisions removed from meeting times. This will also remove the need to take up much of more senior staff’s work time as they will not have to vet all the smaller ideas and questions from the team. Slides are often a waste of time to make as well as a waste of time to present. They fill space rather than inform. Do not use slides for anything except data that is essential to the point you must present. Limited writing. Limited pretty pictures. Just data, wireframes, hard facts and verbally explain the rest. All your decisions and input at the meeting must also be based on verifiable data, rather than speculation or “I just know it”. Otherwise, decision-making is hampered. If you really know you have a good solution, you will be able to succinctly explain why it is so. Starting time should be strictly enforced. There is rarely a good reason for people not to turn up at 09:00 rather than 09:05. 5 minutes may sound small, but if you have 6 meetings across the span of the day, this will compound into 30 minutes of wasted time. Develop a reputation for a no-tolerance to turning up late to meetings. I used to have a professor who locked the auditorium door precisely on the hour. Attendance for that lecture was always pretty good! Sure, there can be genuine reasons for being late and those are always to be accepted. But 9 times out of 10, everyone is able to be there with no excuse except tardiness. That’s why you have the agenda in advance. Don’t go if you have nothing to contribute, and just check the minutes of the meeting later to catch up on what happened. Equally, do not skip meetings where your presence is needed in order to answer questions or provide data. Managers need to go to the social events in order to maintain relationships with the team, boost morale, and allow more casual access. Meetings are better when the questions asked are questions that can only be answered by that particular mix of attendees, rather than things that can easily be found elsewhere or by two individuals conversing. Perhaps this meeting is the only time you see a particular colleague – use that opportunity. Is it the only time sales and product teams are in the same room? There are many questions that need to be asked in this moment than can be answered over long email threads. If they don’t, it was a pointless meeting. If they weren’t expecting a to-do list, they shouldn’t have been there. If group get-togethers are solely for hard-paced get-it-done meetings, then a poor morale will build up in the company. There need to be more relaxed settings for teams to hang out. They also need to be organized, and invites or notifications sent out. A ‘casual corner’ in an office is all well and good, but a full team invite to chill is also important to make sure the more introverted or super-busy are included in the bonding. No phones, no iPads, no ereaders, no laptops open UNLESS you are a disciplined note-taker. In this age of ADHD this might sound impossible. But the reason you’re meeting in person is because it is necessary. Checking email or Twitter while someone is sharing their ideas or results means you are not engaging, and also being disrespectful. A 15 – 30min meeting should not spell disaster for 99% of your interactions that day (bar instant customer support or crisis negotiations). If you cannot resist changing between tabs whilst taking notes, switch to pen and paper and type up the tasks after the meeting. Are there some people in the company who would take it personally not to be invited to a meeting, despite not having anything much to contribute it? There are some who feel that they should ‘be’ there anyways. Make an all-round company objective to start holding meetings for the people who have an active input to give, and that everyone else will be kept informed by way of email or a collaboration tool. This approach to reducing meetings to ‘essential people only’ needs to be consistent and explained as a practicality and not a hierarchy issue. Depending on the tasks that need to be done, you need to find suitable ways of measuring if things are getting done. How many leads per month should a salesperson close? How many pieces of content should a marketer produce? How many bug fixes should the tech team be able to get done? How long would it take the biz dev guy to get that partnership deal done? If you have an idea of the average acceptable output then use it as a benchmark. Don’t let this mean you get sucked into micromanaging. Make it about results. If a team member is able to accomplish the task with 20 emails rather than 100, awesome! Everyone can do their part to make meetings go faster. No matter how sophisticated computers are, the best computer is the human brain. If you have an answer or piece of information that your colleagues could find useful in a meeting, give it to them. Don’t be shy! The faster people get the right info, the faster they can move on with the job at hand. Sometimes, magic happens and meetings suddenly turn in an unprecedented but awesome fashion! Yes, timing is important – BUT if great ideas suddenly start rolling out, and really creative solutions start bouncing around savour the moment to harvest these ideas. Sometimes it’s just a serendipitous series of events, or just the right combination of factors. You’ll know when it happens. Encourage, but don’t force. A classic sign of someone not wanting to be there is how often they check what time it is. Everybody has different personal commitments. Everybody has different preferences for social activities. Despite your best efforts, it’s possible that not everyone on the team gets along. This one came to mind from an experience I had when a guest at a medium-sized company party once. We were all having breakfast at a hotel (about 300 people as far as I recall) and I wanted to go back to bed for a while. The marketing or event team (I don’t know which) actually stopped me from going because they insisted I had to be in the room when the CEO walked by! I was baffled, mostly because I explained I was not an employee. And yes – they made me march back to my chair and suffer my headache for an extra hour. Instituting change is always tough. But think about it in terms of small steps. Managers need to take the lead on the new meetings format, and maintain the message that it is not an exercise in excluding people but of practicality. Employees should be encouraged to question their presence at meetings where they feel they have little real value to add or take away that couldn’t be conveyed in an email or report. TIme is the most valuable thing we all have. This entry was posted in Product and tagged conducting effective meetings, effective meetings, productive meetings, productivity improvement on June 2, 2014 by David Arnoux.